Joshua Abarbanel lives and works in Santa Monica, California. Engaged in an ongoing examination of time, his art frequently references forms, colors, and compositions evocative of biological, botanical, geological, and mechanical structures. His recent series of wood sculptures combines the use of state-of-the-art technological equipment and hand-built construction. The inspiration for these works comes from his long fascination with structures of the natural world, as well as from parts of ideologies including Romantic landscape, environmental art, and wabi-sabi. Abarbanel’s work was the focus of a solo exhibition in 2014 at Hinge Parallel Gallery (Culver City, California) and will be included in a spring 2016 two-person show at Porch Gallery (Ojai, California). Two sculptures from his Reef series were included at the Fleming Museum of Art (Burlington, Vermont) in the group show In Grain: Contemporary Works in Wood (2015). In the fall of 2016 he will present a large-scale sculpture at the Jewish Museum Berlin for their exhibition, Golem, and a new body of work inspired by his recent shipboard residency in the Artic Circle will appear at the Berkshire Museum (Pittsfield, Massachusetts) in early 2017. Joshua Abarbanel is engaged in an ongoing examination of time. His art frequently references forms, colors, and compositions evocative of biological, botanical, geological, and mechanical structures. Inspired by fractals, accretive formations, and the Fibonacci sequence, Abarbanel often creates work that simultaneously evokes microscopic and aerial perspectives, composing elements within the pieces to serve as metaphors for archetypal relationships between people, between individuals and communities, and between humankind and the planet. With an MFA in ceramics and expertise in digital tools, Abarbanel employs a variety of media. His recent series of wood sculptures combines the use of state-of-the-art technological equipment and hand-built construction. The inspiration for these works comes from his long fascination with structures of the natural world, as well as from parts of ideologies including Romantic landscape, environmental art, and wabi-sabi. Abarbanel’s work was the focus of a solo exhibition in 2014 at Hinge Parallel Gallery (Culver City, California) and was recently included in a two-person show at Porch Gallery (Ojai, California). 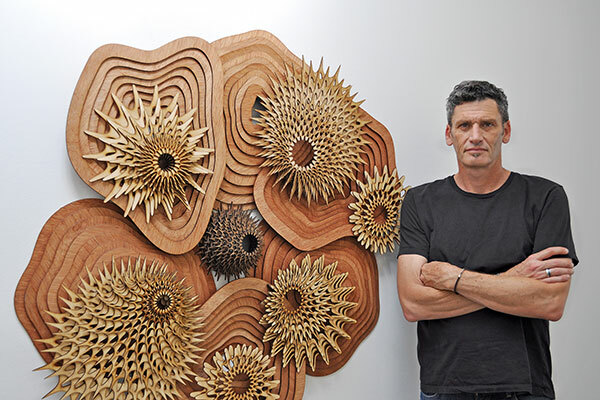 Two sculptures from his Reef series were included at the Fleming Museum of Art (Burlington, Vermont) in the group show In Grain: Contemporary Works in Wood (2015). In the Autumn of 2016 he will present two major works: first, a large-scale sculpture at the Jewish Museum Berlin for their exhibition, Golem, and second, Joshua Abarbanel: Finding North, a new body of work inspired by his recent shipboard residency in the Artic Circle, appearing at the Los Angeles Harbor College Art Gallery. He received dual undergraduate degrees in art and psychology from the University of California at Berkeley and a Masters of Fine Art from the University of California at Los Angeles. Upon completing his MFA he delved into the world of digital art and graphics, disciplines he teaches as a professor at Los Angeles Harbor College. He lives and works in Santa Monica, California. I have always been drawn to the natural world as a source of fascination and wonder. My earliest childhood memories are as a toddler living on a farm abroad. Soon thereafter my family returned to the United States and I grew up in Southern California, where I relished the easy and frequent access to the ocean, mountains, and deserts. I also love books about science, particularly those with images of biological and botanical organisms as well as geological forms from the natural world. One volume in particular stands out in my memory: Kunstformen der Natur (Art Forms of Nature), published in 1904, which features amazing illustrations by nineteenth century German naturalist and illustrator Ernst Haeckel of microscopic life forms. Beyond the enormous aesthetic appeal of naturalist illustrations like these, there is more at play. On another level, they are about the relationship of information, the grouping of individual assets within larger structures. I think often about these metaphysical constructs—individuals in relation to the whole group, groups versus groups, humans in and of nature—as I am creating discreet elements that go into the objects I make as well as when I am considering the overall compositions of the pieces. On the most macro level, I am very interested in exploring concepts of time and memory. Of course, nature is the ultimate marker of time, engaged in a constant cycle of creation, cessation, and regeneration. As a maker of things, I relate to and am greatly inspired by this.